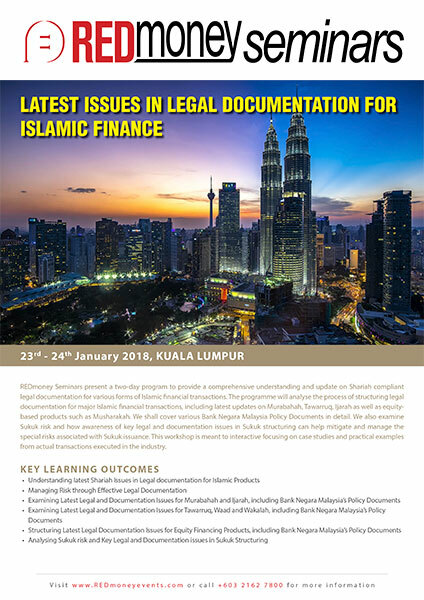 REDmoney Seminars present a two-day program to provide a comprehensive understanding and update on Shariah compliant legal documentation for various forms of Islamic financial transactions. The programme will analyse the process of structuring legal documentation for major Islamic financial transactions, including latest updates on Murabahah, Tawarruq, Ijarah as well as equitybased products such as Musharakah. We shall cover various Bank Negara Malaysia Policy Documents in detail. We also examine Sukuk risk and how awareness of key legal and documentation issues in Sukuk structuring can help mitigate and manage the special risks associated with Sukuk issuance. This workshop is meant to interactive focusing on case studies and practical examples from actual transactions executed in the industry. Johan is the managing partner of J. Lee & Associates, a legal firm in Malaysia. He graduated with LLB (Hons) degree from International Islamic University Malaysia. He also holds a Master of Comparative Laws degree, a post-graduate Diploma in Shariah and Legal Practice both of which from International Islamic University Malaysia and, an MA in Economics for Competition Law from King’s Collage London. He is currently a qualified member of the Chartered Institute of Arbitrators, UK as well as a mediator of the Malaysian Bar. He is an advocate and solicitor of the High Court of Malaya. Proficient in English, Malay language, Mandarin, he is also the first Chinese origin Shariah practitioner ever admitted by the Shariah court. His current practice includes corporate and commercial law, competition law, compliance and Islamic corporate finance related matters. He is instrumental in developing Islamic banking, Takaful and Islamic corporate finance documents and exercises for several financial institutions as well as corporate and governmental entities in Malaysia. Johan lectured in the law faculty of International Islamic University Malaysia since 1999 for both undergraduate and postgraduate law programmes. He has taught for a special exclusive diploma programme in Islamic Banking, jointly offered by IIUM and the Bar Council. He also lectures occasionally in various other local universities, Bank Negara Malaysia (BNM), as well as Institute Latihan Kehakiman (ILKAP) and Jabatan Kehakiman Syariah Malaysia (JKSM) for both civil courts and Shariah courts judges concerning Islamic banking. In 2006, he was a visiting scholar to the Asian Law Centre of the University of Washington. He is currently a Shariah consultant to governmental agencies as well as government-funded banks. He is the author of the book ‘Legal Documentation for Islamic Banking’ published by the IBFIM, and co-author of an upcoming book ‘Islamic Financial Services Act 2013: Commentaries’ to be published and launched by the Current Law Journal. Johan is now a member of the Shariah Advisory Council (SAC) of the Association of Islamic Banks Malaysia (AIBIM and is a consultant to new law practices in Malaysia, Brunei, Singapore, Indonesia and the UK. With experience in Asia and the Middle East, Azlin works with banks, corporates and regulators on Islamic and conventional finance matters. Her clients have included Asia, Middle Eastern and international financial institutions and companies. Azlin has also worked with financial regulators in Asia and the Middle East on the approval and regulation of Islamic finance products, and advised financial institutions on the establishment of Islamic banking businesses, assisting with regulatory approval and documentation. In addition to Islamic financing, Sukuk, Murabahah and securities, she advises on conventional finance, including syndicated lending, debt issues, project and asset finance, and restructuring.